This is about acquired hydrocephalus due to blockage of CSF flow and absorption due to a stroke related cause. We ill not be discussing congenital or childhood hydrocephalus. CSF is formed from the choroid plexuses in the lateral (70%), third (5%) and fourth (5%) ventricles and ependymal cells(20%) lining the ventricles. The epithelium of the choroid plexus forms a barrier between blood and CSF filtering out various substances. CSF Flow is from the lateral ventricles through the foramen of Munro into the third ventricle and then through the aqueduct of Sylvius into the fourth ventricle. The aqueduct is only 2 mm in diameter and is a common site of CSF flow blockage. From there it drains through one of three foramina either laterally through the foramina of Luschka (lateral) or the medially placed foramen of Magendie. 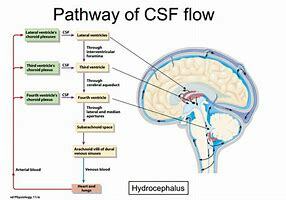 CSF then enters the subarachnoid space. It is finally absorbed by the arachnoid villi into the venous sinuses. Obstruction at the level of the aqueduct causes a non-communicating hydrocephalus. Obstruction to CSF flow at the level of the arachnoid villi causes a communicating hydrocephalus. Lumbar puncture is not contraindicated, in fact, it may be diagnostic as well as therapeutic in those with a communicating hydrocephalus where pressures are freely transmitted through the subarachnoid space. CSF is produced by the action of the Na+/K+ ATPase pump actively moving Na+ ions into the lumen of the ventricles which is then followed by h40. This happens in the cuboidal cell epithelial cells that form the choroid plexus. The choroid plexus releases about 500 ml of CSF per day into a volume of 100-150 ml. The choroid plexus selectively filters the CSF so that its content differs from plasma. CSF has a lower glucose, very much lower protein, low urea and a low amino acids content. CSF protein is 1/1000th that of CSF. The presence of CSF means that the brain basically floats such that the effective weight of the brain is reduced from 1400 g to about 50 g. The CSF also plays a role in the continual drainage of the ventricular cavities and subarachnoid space. The CSF is replaced three times per day and enough is produced in 3 days to fill the entire brain free skull volume. It is no surprise that acute hydrocephalus can be an acutely fatal event if unrecognised and untreated. Hydrocephalus is divided into communicating where the ventricles are in communication with the subarachnoid space and non-communicating where this is obstructed. 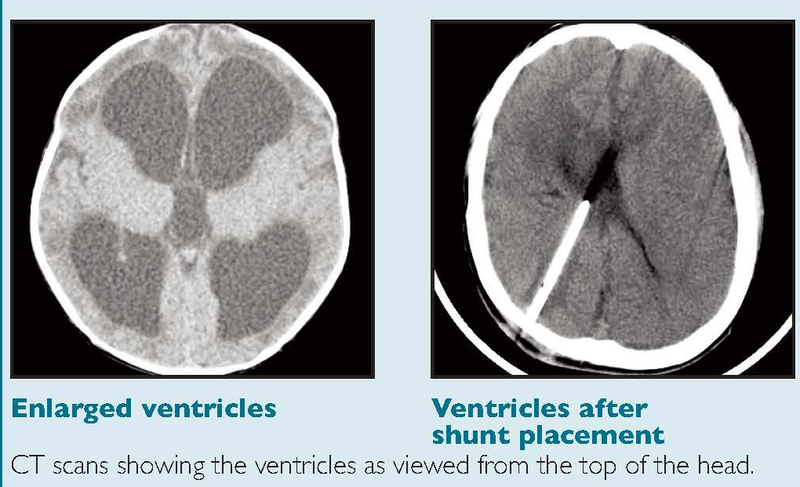 In stroke we more commonly see obstructive hydrocephalus when swelling obstructs the aqueduct or the IVth ventricle. This then leads to a rise in ICP and potential brainstem herniation. Up to 20% of those with subarachnoid haemorrhage will develop hydrocephalus usually within the first 3-5 days. This is seen more when there is a large bleed with intraventricular bleeding or perimesencephalic haemorrhage. The brain itself is surrounded by 3 membranes sandwiched between it and the skull periosteum. Hydrocephalus is the description of excess CSF. It is usually due to an obstruction within the ventricular system or within the channels in the subarachnoid space that allows CSF to be reabsorbed. Untreated it can lead to raised intracranial pressure. CFS acts as a cushion protecting the brain and the brain floats within it. The total volume of CSF is 150 mls. The daily production is 550 ml/day. The entire CSF replaces itself 3 to 4 times per day. The normal intracerebral pressure (ICP) is 5 to 15 mmHg. The rate of formation of CSF is constant and is not affected by ICP. Absorption of CSF increases linearly as pressure rises above about 7 cms h2O pressure. At a pressure of about 11cms h4O, the rate of secretion and absorption are equal. Nausea, vomiting, eye signs and eventually coma and even death. Foramen of Monro Occlusion of the foramen of Monro is an unusual cause of obstruction of CSF flow. Congenital atresia or stenosis of the foramen of Monro is quite rare. Tumours, blood and oedema and other mass lesions and colloid cyst may grow to such a size that they occlude one or both of the foramina. Aqueduct of Sylvius Aqueductal stenosis is a congenital malformation. Tumours, blood and localised oedema can cause obstruction. Dilation of ventricles above. Outlet foramina of the fourth ventricle (Luschka and Magendie) The inability of CSF to exit the fourth ventricle usually results from a posterior fossa tumour, blood or oedema that occludes the exit foramina of the fourth ventricle. Severe infections of the CSF pathways can also lead to scarring and obstruction of the outlet foramina of the IVth ventricle. The key investigation is CT which will show the dilation of the ventricular system. Initially the first parts of the ventricles to dilate are the temporal horns. This can be seen early on with axial slices from a CT, the temporal horns should come to a point. They appear rounded and this suggest that pressure in the ventricles is raised. A mass lesion or posterior fossa oedema and blood may be seen. A large stroke may result in midline shift and consequent contralateral ventricular dilatation. An acute increased in pressure within the ventricles causes compression of the venous return in the brain parenchyma immediately adjacent to the ventricle. This manifests as periventricular oedema (reduced density), especially the frontal, temporal and occipital horns. This can all be confirmed on MRI if indicated and this can help to determine the level and cause of obstruction. Initially observation and a wait and see approach may be tried as sometimes the hydrocephalus can settle spontaneously. Some have used Lumbar puncture e.g. removal of up to 20mls of CSF to get a closing CSF pressure of 15 cm H20 if there is no evidence of obstruction within the ventricular system. Where pressure is equally distributed throughout the ventricles and subarachnoid space then the risks of brain herniation are low. With SAH an LP may also help to remove the blood in the CSF space. Remember that it was not that long ago that SAH before CT imaging was widespread was diagnosed by clinical history and LP and then referred for DSA. This management course would be discussed and agreed with the tertiary centre. Referral to neurosurgeons is warranted to allows rapid shipping of the patient if things get worse. Then, if there is progression then they can make a burr hole and insert a catheter through the brain into one of the lateral ventricles and allow the CSF in the ventricles to drain out. The is called an external ventricular drain. These are usually placed over the right parietal lobe and can easily be seen on CT scan. There are concerns with SAH that suddenly dropping ICP may precipitate more bleeding so CSF pressures should be maintained. Occasionally they can develop ventriculitis. 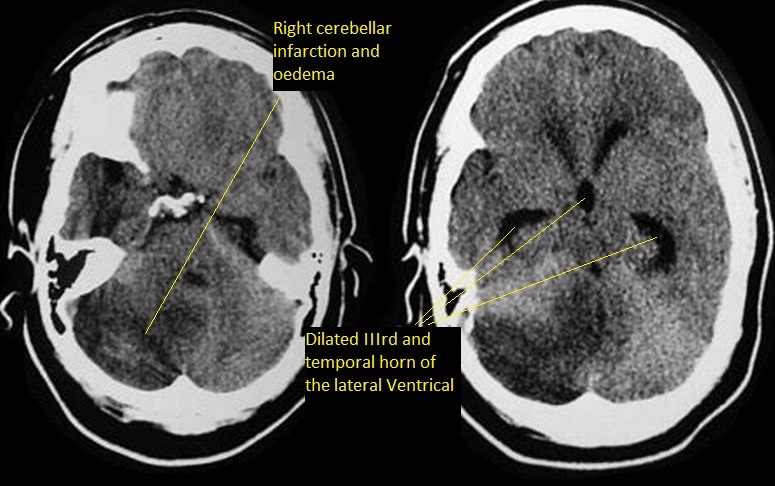 Hydrocephalus in adults can be seen more so with bleeding into the ventricles or with external compression on the aqueduct due to posterior fossa swelling which can be due to bleeding or infarction. It is also seen after SAH. The main issue in treatment is that early shunting when there is blood and the high protein content of the cerebrospinal fluid (CSF) may block the shunt.